Who are the best Saxon athletes of the passing year? This is the question being asked by the State Sports League of Saxony and the sports journalists each year anew and being answered by tens of thousands citizes keen on sports. 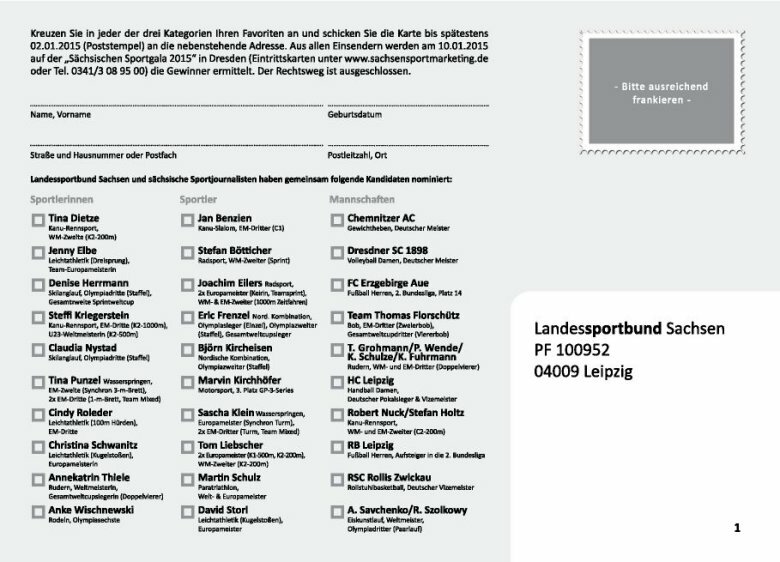 In the course of the biggest and most important athlete survey in Saxony a male athlete, a female athlete and a team can be elected. For this election, voting cards are being used where each participant can check their favourite sportsman, sportswoman and team. Thousands of cards are returned and the checkmarks in all three categories have to be counted. In 2014, we were asked by SachsenSportMarketing GmbH, the company in charge of the election, if we could count the votes as a service and if the card in its current design was suited for an automatic evaluation. No problem for FormPro! Each category is marked with 10 checkmark zones which can be grouped as multiple-choice questions. The zone checked in each category will return the name of the athlete or team. This way, invalid multiple checks within the same category will be marked as errors automatically. The results of the valid cards will be exported to MS Excel where the actual vote counting can be done. The actual challenge is the time limit. We receive most of the cards by 5 January around 2pm and are being asked to return the results by the next day. This is because the athletes of the year will be announced at the Saxon Sports Gala only a few days later. So there is not much time for preparations. But only 90 minutes after receiving the cards all of them are scanned and the result is being returned to SachsenSportMarketing GmbH the same day. We are happy to support all future elections of Saxony’s Athlete of the Year.